If you ever wanted to become a Santa claus and see how you looked in the costume then its the chance for you to get into the character of Santa Claus very easily and see how you will look like when you become Santa Claus. 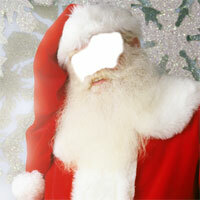 We have added the Santa claus template for fun on our website photmica.com. You will look when you add your picture to the Santa Claus image as in the photo editor here. Just upload your photo and adjust on the editor, save it to your computer and show to your friends to have fun.